From our La Zenia sales office we are proud to offer this beautiful, cheap, bargain two bedroom townhouse located in San Pedro del Pinatar, close to Pilar de la Horadada, San Javier and Los Alcazares. This delightful 2 bedroom 2 bathroom townhouse is just a 2 minute walk to the salt lakes at San Pedro and less than a 10 minute stroll to the beautiful beaches at Lo Pagan with its beachside cafes, bars and restaurants. As you enter through the front gate into the front garden which is partly tiled offering off road parking. You enter the front door into a good sized reception room leading to the family living area with separate kitchen which includes wall mounted and floor standing kitchen units with co-ordinating work top. There is a large storage cupboard under the stairs and a downstairs shower/toilet and a good sized bedroom overlooking the back garden. The first floor has a large bedroom and bathroom with good size terraces to the front and rear of the property. From the front terrace a staircase leads to the spacious sun-drenched solarium where you have a glimpse of the sea. The property comes with air-conditioning in the living room and master bedroom. This townhouse is conveniently situated close to shops, bars, restaurants, supermarkets, etc. 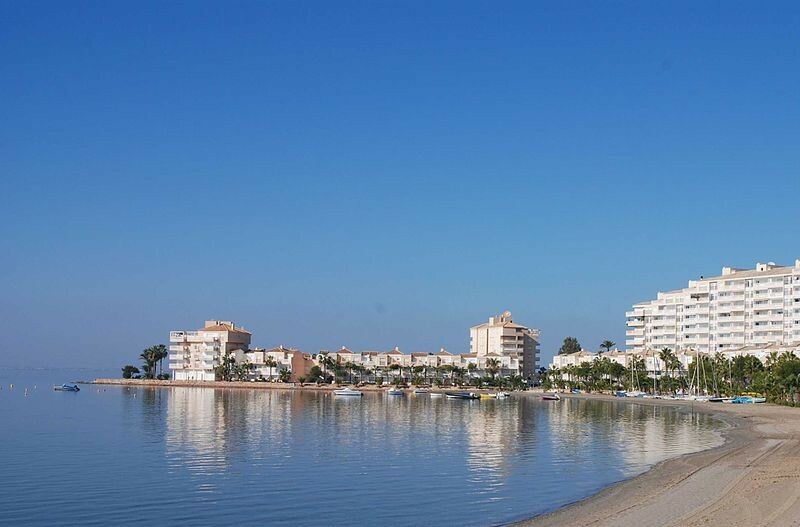 the golden sandy beaches of the Costa Blanca are only 10 minutes away, as is the AP7 motorway, it is just a 15 minute drive to Murcia airport or Alicante airport is less than an hour away. You are only minutes from any of a dozen world class golf courses so because of its proximity to the golden sandy beaches of the Costa Blanca, Orihuela Costa, Costa Calida and the Mar Menor, not to forget all of those World famous Golf courses means that should you buy this wonderful property, not only will you have a fabulous investment, with its increased rental and growth potential but you will also have everything you might ever need to enjoy your life in the Spanish sunshine.